Princess Eugenie is a member of the British royal family. She is ninth in the line of succession to the British throne, after her elder sister, Princess Beatrice of York. 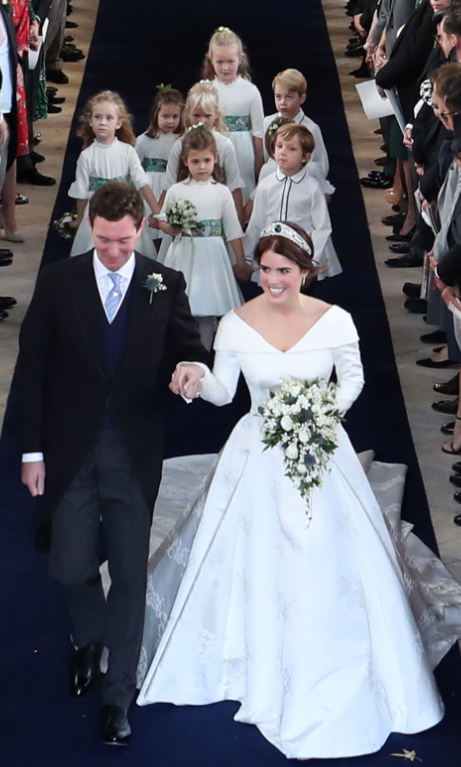 Royal wedding: Princess Eugenie marries Jack Brooksbank. Princess Eugenie has married her long-term partner Jack Brooksbank at St George's Chapel in Windsor Castle. The younger daughter of Prince Andrew, Duke of York, and Sarah, Duchess of York who is the seventh in the line of succession. Princess Eugenie was born on 23rd March 1990 with the birth name of Eugenie Victoria Helena. Currently, her age is 28. She was born in Portland Hospital, London, England. Her nationality is English. She was a daughter of Prince Andrew (Duke of York) and Sarah (Duchess of York), her parents. She is the sixth grandchild of Queen Elizabeth II and Prince Philip, Duke of Edinburgh. On the seventh day after her birth, it was announced that the Duke and Duchess of York had named her Eugenie Victoria Helena and was baptized at St. Mary Magdalene Church, Sandringham, by the Bishop of Norwich, on 23 December 1990. Her godparents were James Ogilvy (her father's second cousin), Captain Alastair Ross (who was unable to attend), Susan Ferguson (her maternal grandfather's second wife), Julia Dodd-Noble, and Louise Blacker. She was named after Victoria Eugenie of Battenberg and after Princess Helena, Queen Victoria's granddaughter and daughter. When she was only 6, her parents divorced. When she was 12, she underwent back surgery at the Royal National Orthopaedic Hospital in London to correct scoliosis in the year 2002. She made a full recovery and is not expected to undergo any further surgery for the condition. From the year 1992 to 1993, she joined Winkfield Montessori and then joined Upton House School in the year 1995. After that, she attended Coworth Park School from 1995 to 2001, and then St George's School, near Windsor Castle until 2003. She began studying at Newcastle University in September 2009, combining Art History, English Literature, and Politics. She completed her studies in 2012, earning a 2:1 in English literature and history of art. In July 2015, she moved back to London to work for the Hauser & Wirth art gallery as an associate director and was promoted to be a director in 2017. Princess Eugenie is a beautiful woman. She stands at 5 feet 7 inches (1.72 meters). Her balanced weight is 60 kg. Her body measurements are 36-28-38 inches. She wears a 34A bra size and a size 6 dress. with her charming smile and glowing face, she attracts a lot of followers towards her. Eugenie undertakes minimal public engagements, which are usually connected with the charities she supports, including the Teenage Cancer Trust and Children in Crisis. In the year 2008, she performed her first solo public engagement, opening a Teenage Cancer Trust's unit for young cancer patients in Leeds. She visited the Royal National Orthopaedic Hospital (RNOH) on 2nd June 2011. In January 2013, she along with her sister Princess Beatrice visited Berlin and Hanover in Germany to undertake a series of engagements. She along with her sister, Princess Beatrice, became Patrons of the Teenage Cancer Trust in June 2016. In the year 2016, she visited a safe house run by The Salvation Army and met with victims of sexual abuse and modern slavery. In the year 2017, she became the ambassador for the Artemis Council of the New Museum, a by-invitation membership initiative focused solely on supporting female artists and also became an ambassador of Project 0 in the year 2018. In the year 2018, she is serving as an ambassador with Street Child. Eugenie is a recently married woman with Jack Brooksbank. The couple has been dating for seven years when they met through friends at the Swiss resort of Verbier. Jack proposed on one knee in Nicaragua, as the couple holidayed; he did not present a ring at the time but had bought an oval-cut Padparadscha sapphire beforehand. Jack confirmed he had asked Eugenie's father for permission in the couple's brief TV interview, conducted by "The One Show" host, Matt Baker. The Duke of York's Office at Buckingham Palace announced the engagement of Princess Eugenie and Jack Brooksbank on 22nd January 2018. On 12th October 2018, the wedding of the couple took place at St George's Chapel, Windsor Castle. As Princess Eugenie is ninth in the line of succession to the throne, the Queen's permission to marry was not required under the Succession to the Crown Act 2013. The princess Eugenie is worth around $5 million. She is earning a good amount of money as wealth and royalty go hand in hand, no matter how un-involved Princess Eugenie is in public life. She is satisfied with her net worth. She has represented the Royal Family working with the Teenage Cancer Trust and while visiting the National Orthopedic Hospital. She has an older sister named Beatrice. 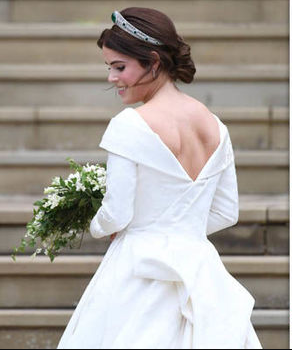 She got engaged to wine merchant Jack Brooksbank in July of 2018. She was the niece of the late Princess Diana.